Another great small trailer option! 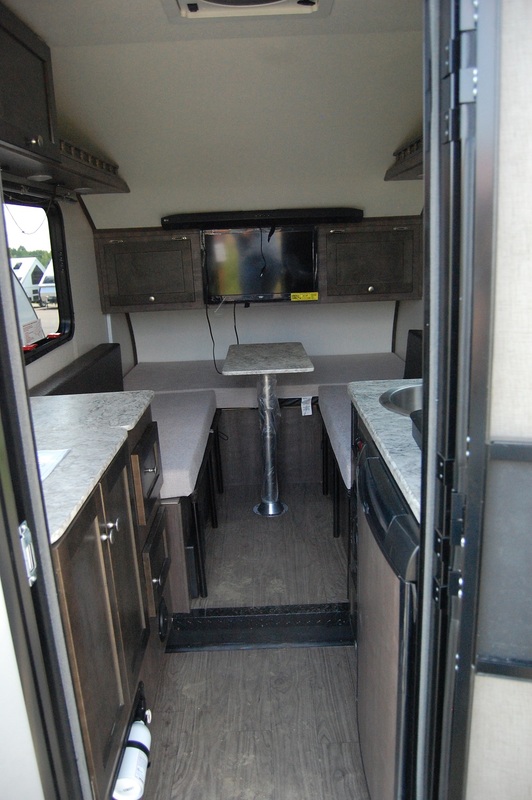 I agree that a nice option for the solo traveler would be to use one side of the dinette as a “twin” bed keeping the table up and the other side of the dinette for sitting. Very nice. It’s always nice to see a manufacturer being creative and coming up with new ideas. Storage is always a problem in small trailers. Can it be ordered without the microwave to allow for another kitchen cupboard? 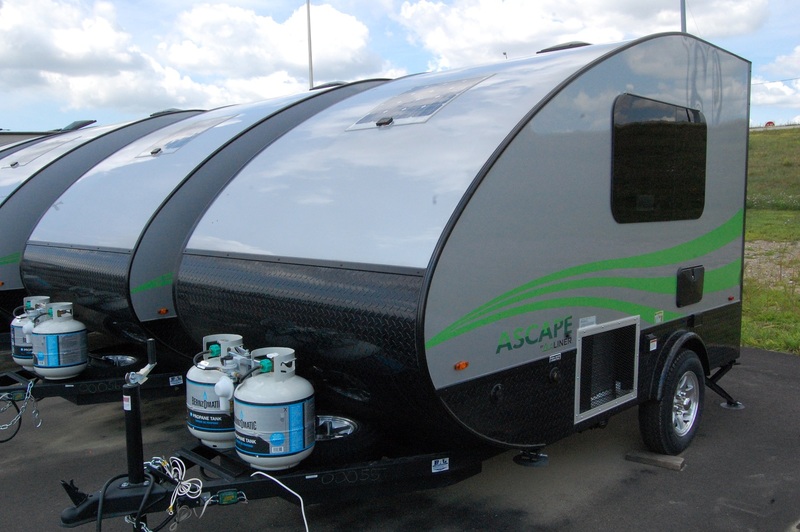 Trailers in Europe and Australia have similar floor plans and some made of fibreglass. See a newer article from this publication about a model with fewer amenities. Nice review. My wife and I love this little camper. This fits the bill perfectly for us. Some options I would like to see. A front window, a longer tongue with a storage box, or platform. A longer version with a side entrance and wet bath. Great job on your blog. The bed is only 64″ wide, so unless you are shorter than that, you would be uncomfortably cramped if not impossible to sleep on just the twin bed. The bed is 77″ long running front to back, so you could have a narrow twin bed setup sleeping in that direction. It is an interesting setup, and I have been looking at it online. Around 2006, Aliner was making something similar as every once in awhile, I see one used being sold, it was called the “Cabin A”. Also, I believe the Amelia was a Chalet product. I am a little “RV obsessed”. You sleep end to end,….not side to side. Great article and photos! We are the brand new & proud! owners of an Ascape. She’s had many admirers and we’ve given many tours. There are a few small construction details that are disappointing. The cabinets (beside the TV) hinge up to open but there is nothing to make them stay up while you rummage around except our jerry-rigged bungee cords. Also, the side rails for the open shelves on both sides over the windows are quite handy, but the glue used to hold them to the shelf melted/loosened/came unstuck and fell off when the camper was parked in the sun. I am sure that glue is cheaper than screws, but screws would make more sense and prevent the rails from falling off. The door can be locked with a deadbolt or the latch closure, but the deadbolt cylinder pulled right out of the door during our second trip. Finally, and only as a personal preference, we would like to have a lighter-c0lored wood for the cabinets and inside wood detail. All in all, while there have been these few relatively small disappointments, we are looking forward to taking the Ascape on many more trips. It’s easy to stock and prep for short trips, and I think it will be just as easy to take on longer trips when we have the time and feel more confident. Happy camping! looking into get one. My question is are you both comfortable in it space wise. If you should get caught in the rain. We are deciding between this or a aliner scout. It would be my husband and myself and we try to be outside most of the time but I just don’t want to fell cramped. I currently own a 2018 scout with A/C built-in instead of outside unit. I think they only did this a couple of years? Woefully inadequate. On hot days in Indiana you can’t go inside. Due to the design there are multiple places for air leaks (not water). That being said it has been a wonderful camper and been very satisfied. We will likely trade for the Ascape. My wife fell in love with it. Of course it will cool more easily and anything more than the smallest portable electric or propane heater. The pricing is all over the map. I’ve see prices for the exact same Ascape vary by as much as 7,000 dollars: anywhere from 18 to 10 grand. We have owned several different type of campers. Pop ups to giants and back. So what is the dry weight for this.? Although Ascape is shorter, the floor plan reminds me a lot of Lil Snoozy, which I’ve always admired. Lil Snoozy doesn’t have propane, which is a shame. With rooftop AC it’s 8’4″, and without, it’s 7’5″. You probably mean a “40 Watt” solar panel!! 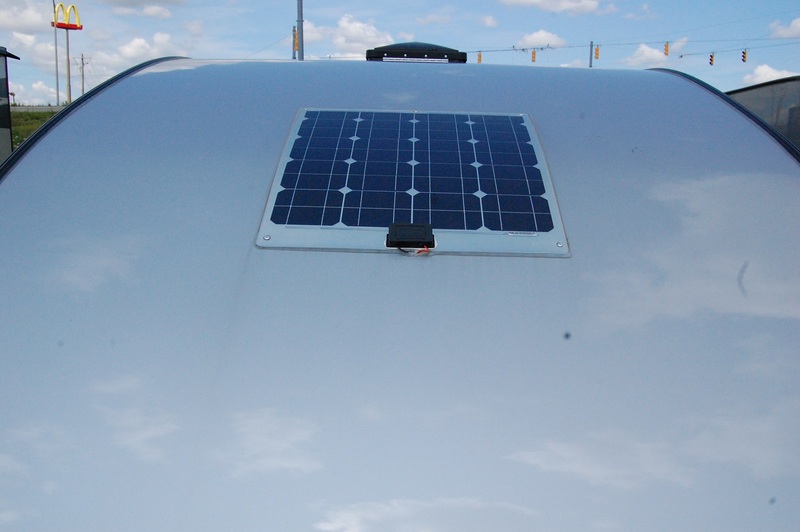 A 40 Amp solar panel would be monstrous! Good catch! I’ll edit the post. Note liking it – looks like they cut a regular travel trailer in half in an attempt to create a small trailer. I don’t think a couple of bike down the center would be an issue. You could always pull the table during transit for a little extra length. Our two road bikes fit fairly easily inside with the table removed. However, we did have a “Jack It” hitch-mount bicycle rack installed. It works well, though if I were an inch shorter than 5’2″ I wouldn’t be able to put the bikes up without a stepstool. I just purchase an aliner ascape and had a jack it installed. They needed to change the wrench on the front and now need to use jack stands to take off the wheel in the hitch. This is kinda of a pain as its an extra step. Did you have to make this change? I purchased a 2018 Ascape earlier this year (in May). It’s been a great little camper. Has everything I need, and then some, and sleeps me, my 15 year old son, and my 60 lb dog just fine in the queen size bed. We just had to learn (including the dog) that only one person can be up and about inside the camper at a time. I have the model with the wall mounted A/C unit. It sits inside one of the benches. I think I would have preferred the roof mounted one, as the wall mounted takes up some storage space, which could be nice to have. But I do like the fan on those days that it’s not warm enough for A/C, but warm enough to have it running to move the air around. And I’ve been doing OK with the storage I have with the A/C in bench, so I’m complaining. Overall, it’s a very nice little camper. I’ve had several camping trips in it already, and plan on many, many more int he years to come. 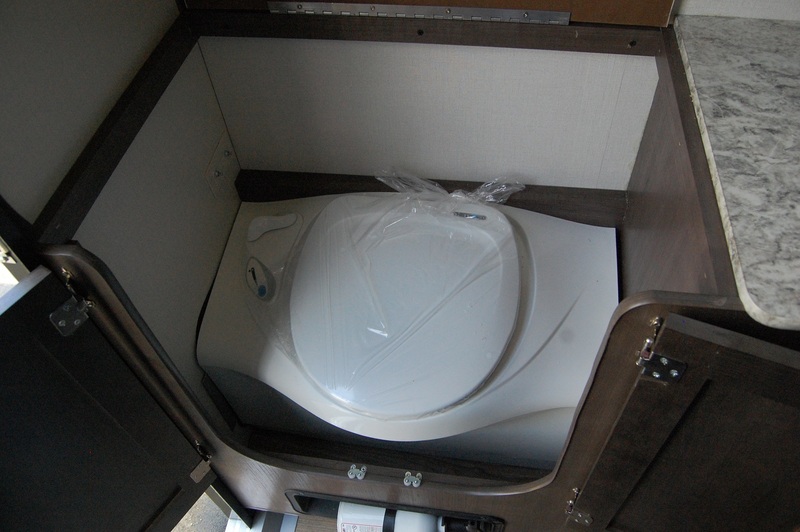 And one other big feature that I like that you can’t build into the camper – It’s a real conversation starter! This looks like a great option for a smaller camper. We looked at the Tab and the Lil’Guy but those don’t even allow you to stand up in them fully. However, they do have a wet bath which is the main reason that might keep some of us from springing for this. A wet bath would synch the deal. This has so many nice features. I might be one of the rare people that like the cheaper side air conditioner. If it craps out it’s $200 and a nearby Walmart and it’s replaced. A roof air conditioner can add to potential leaks in the future, a failure would be outrageously expensive and only fixable and replaceable at the dealer. So that would be a huge savings and convenience. I just wish it had a full wet bath. It certainly seems doable. I bought an 18 Ascape without the roof a/c. The cube unit in the side works ok but I find having a small fan to help circulate air when the bed is set up is helpful. It is a little heavier towing than I expected (I drive a 17 Escape) but the small torqued motor seems to do ok. I do notice the wind drag difference but that is to be expected. The bed opens to queen-size and it is very comfortable (although we utilize one of those foam, coned shaped mattress pads, which helps a lot). We just roll it up towards the front when done and it doesn’t really cost us any space. Bottom line is thus far we are very happy with our purchase. See you out there in the campsites! I can’t comment on the Escape, but I have a 2.4L (4-cyl) Jeep Patriot that pulls my Ascape just fine. It’s a little sluggish on hills, but not that much. why not post a price? Price without toilet and ac? 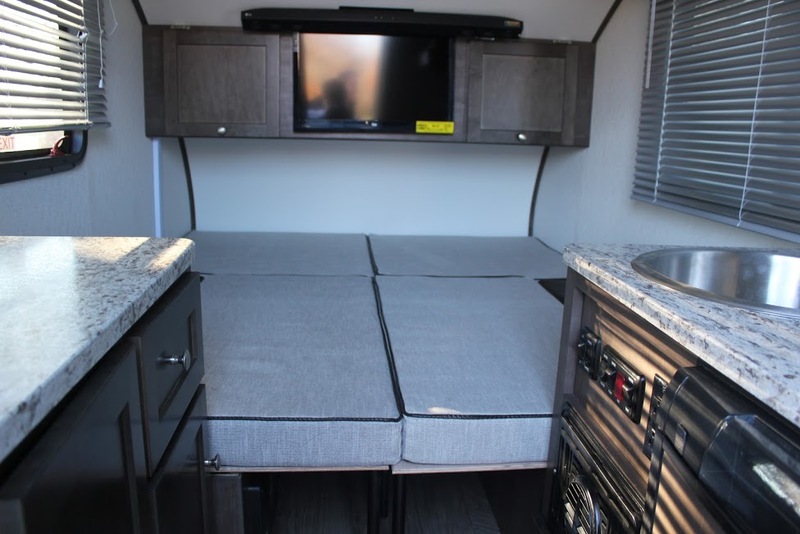 The way Aliner has the options set up, the toiler and AC are part of a single options package that also includes the rear awning, and the 23″ TV and sound bar. From an MSRP sheet I have, the option package is $1500, so that should give you an idea what that brings your price down to. I have a 2017 T@B 320 Max S at this point. I am 6ft. tall and have to bend over and can not stand straight up which is tough on my back. I am considering the Ascape in the next year or so, but would like a wet bath inside along in addition to the exterior shower now available. I love the rear door entrance as it gives me room to stand and also is near the rear door for cooking which allows for a nice breeze through the camper while cooking, etc. If you add a wet bath that a 6ft. guy can stand in, then I will be trading in my T@B very soon. I have ALiners in the past and I have been very happy with the product. Thanks Aliner for creating a more European camper which is affordable and easy to maintain and tow ! I have a 4 cylinder Hyundai elantra. Towing cap is 2000 lbs can I tow this? I have a 2.4L (4-cyl) Jeep patriot with a 2000 lb capacity. I can tow it fine. Just be careful about not loading too much inside and going over the 2000 lbs. Also, watch your tongue weight. Just filling the water tank on mine put too much weight on the tongue, and I could really feel it wanting to sway (it was a short trip, but I’m not doing that again until I get a different tow vehicle that can handle it). Can it except bigger wheels and tires? I would really prefer 14″ or 15″ if they will fit in the wheel wheels. I do some long distance driving and lite off-roading, (perhaps I should say dirt- roading). A bigger wheel and tire and little more ground clearance is always a good thing. After lots of hours of research into small campers – and a few trips to dealerships in the area – I finally purchased the Ascape in May 2017. It had the best combination of factors that I considered important. Since then, I have used it on two short camping trips. It is very comfortable for one person and a small dog, even using just one side of the bed. The heater and A/C work well, as do most other appliances. However, the trailer is in the shop for the third time, and I’m beginning to wonder about quality control. Most recently, I couldn’t use the trailer as planned after a 200-mile drive. There are currently three issues: 1) the 12v water pump won’t build up pressure in the system and runs every 8 to 10 seconds trying to do so, 2) the propane alarm goes off randomly (it’s very loud) even though there’s no propane smell that I can detect inside, 3) the “auxiliary” LP tank has a leak when turned on and, therefore, cannot be used (this is NOT the reason for the inside alarm). Today, I left it at the dealership, hoping they can get it to function reliably enough to take on an extended road trip in a few months. This is my third small camping trailer, but the first Aliner. Thanks for the update, Loren. Always hate to read things like this. RV ownership should be a time of happiness and not frustration. I don’t think consumers would be too upset for manufacturers to slow down a bit and make sure it’s done right. Hopefully things will get smoothed out for you soon. I very much agree that we’d prefer manufacturers take the time needed during the build to get it right. The Ascape is a great design and I’ve had many people ask about it, wanting to see the interior. They often comment about how “spacious” it feels inside. I still have high hopes this will be my travel and adventure vehicle for trips being planned. Thanks! UPDATE (10/20/2017): The Ascape was repaired at the dealership and is now working well. The original battery was defective and wouldn’t hold a sufficient charge. That’s what caused the problem with propane alarm which is, apparently, sensitive to low voltage from the battery. The battery was replaced. The water pump was not adjusted correctly and two of the fittings weren’t tight enough. With an adjustment and some tightening, it now works fine. 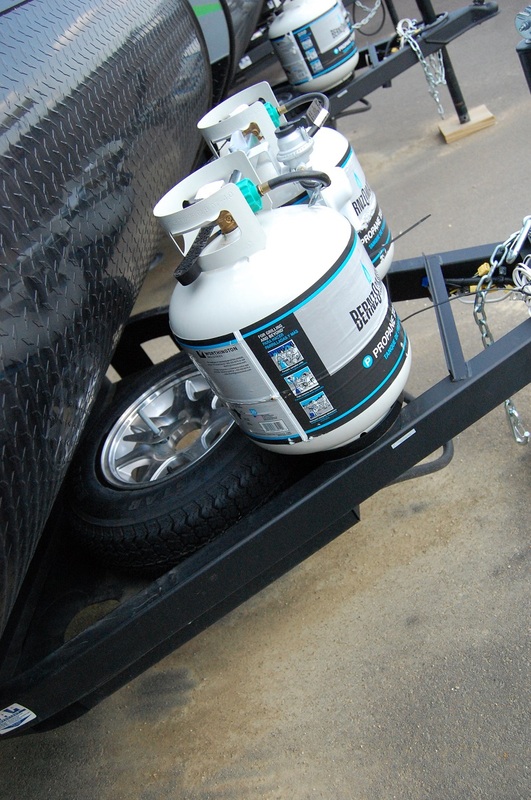 For the propane problem, an exterior propane line was replaced and the auxiliary tank can now be used. Hi Loren, it’s been a few months since your last update. Can you give us another follow up? I have only two fears about buying a new RV design like this. Depreciation when you drive off the lot. And working the bugs out for the manufacturer. So feedback from you folks is very important to those of us who haven’t committed yet. We sure won’t get it from the dealer or manufacturer! Hi, Lee. It’s an excellent design, but it feels like we are working out the bugs of a new product. Mine has been in the shop four times and I have been able to use it only two nights since May 2017. 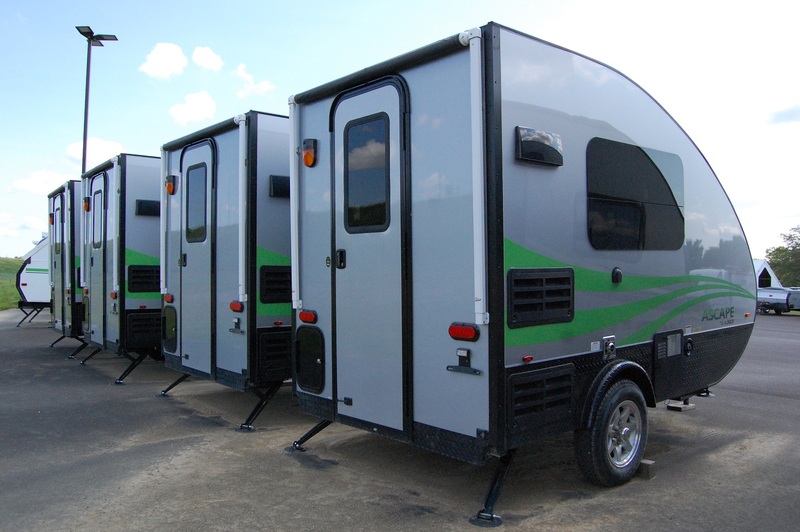 In other places, I have seen advice from owners to consider purchasing a two or three year old RV, because the various issues will have been taken care of. Apparently, initial quality issues aren’t limited just to new designs or certain manufacturers. A few weeks ago, the dealership replaced the LPCO detector which seems to have fixed the problem with the alarm going off all the time, even when the LP tanks were closed. I finally did thorough troubleshooting myself to isolate the problem, because this was the third time at the dealership for the same issue. I hope to take it out one more time before making a decision about whether to keep it for summer travels. For a single person, it seems the perfect design for road trips, but it has to work properly and reliably. If you do buy one, negotiate a reasonable price for it. Thanks for the feedback Loren. I discussed the issues you mentioned to the dealer when I went to look one over before buying. He indicated no one had brought one back to them yet so you may be one of those unfortunate people who got the one they rushed out the door at the end of the shift on a Friday. Anyway I got an exceptional price on one ($3000 less than my local dealer) by driving a couple hundred miles to another dealer. Brought it home and am giving it a thorough once over. Someone mentioned towing it. My Tacoma 4 cyl. Automatic towed it across the desert on level ground with cruise control on with no issues, even got my usual gas mileage. But really noticed it when going up a steep hill and especially in high winds. Still my truck handled it with no issues, uphill in the wind at 55 mph in second gear. It seems to be very stable even when being passed by 18 wheelers. I really appreciate your feedback Loren and hope you don’t have to give yours up. Keep us posted! For Lee: Congratulations on your new Ascape. Interesting that we use the same tow vehicle (4 cylinder Tacoma) and have had a similar towing experience. I added an anti-sway bar that connects to a second ball on the hitch and to the side of the “A” frame on the trailer. It makes it really stable in windy conditions. Same issues with going up steep hills and mountain grades, but overall tows beautifully. Wishing you many happy miles and years with your Ascape. I’ve only had mine in the shop once, and that was for the recall on the propane tank tray. But just before that, I noticed that teh USB ports weren’t providing any power, so I mentioned that and they replaced it. Other than that, I’ve only had very minor issues (leaky plumbing connection that I wrapped with Teflon tape, and the board along the back of the toilet that the counter top hinge was connected to was loose). I love my Aliner Ascape 🙂 Only cons I have are the blinds, most new campers are standard with same blinds, but I will change to pull down shades sometime. I don’t like where the LED light buttons and pump/hot water heater controls are located. Too easy to just hit with hip and turn on. Needs moved to another location or a plastic cover like on frig controls to prevent turning on accidently. One of the first things I did was replace the blinds. I got the pull down kind, and it’s a huge improvement. i wouldnt pay that price for thats double to triple mark up ! and more ground clearance yet still keep all the amenities? ignorance, but I am trying to educate myself. I have a 2017 Ford edge se with out a towing package will it tow this ok.
Hi All, I’m very interested in feedback from current owners. Can I pull the Ascape with a S60 Volvo? Sheri – If you let me know what year and engine you have, I’ll see what I can find out for you. I’ve been looking for a winter ready camper/trailer that can be towed up mountain passes in deep snowstorms for camping at the ski mountains. I wish the titanium package was available for this aliner ascape… or at least add a toilet to the titanium 12. Hi everyone! I’ve enjoyed reading your comments. 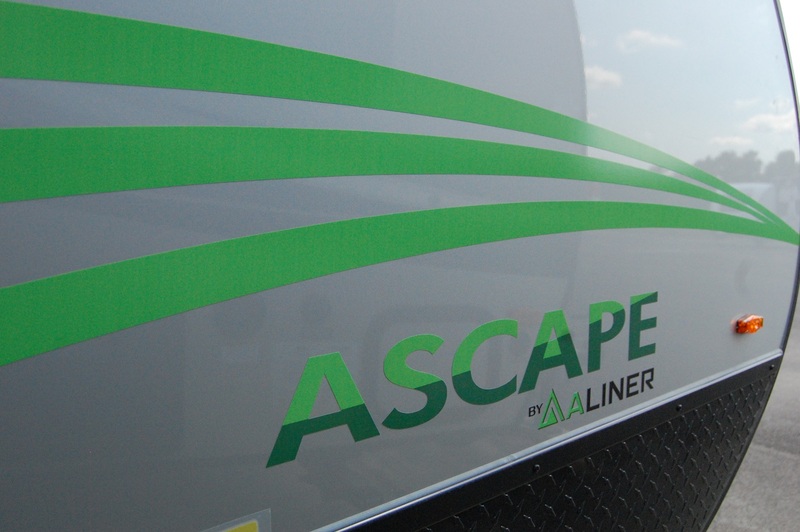 I bought my Ascape Plus in April 2017 – my very first camper! I was one of the unfortunate ones who had issues with my trailer, so I will start there. I had a leak from the emergency exit window, which stained one of the cushions. After my first trip the fridge quit working (a bent fuse) and one window blind malfunctioned. With the trailer being new and the repair shop being unfamiliar with this model, the whole process took about three months. I became so annoyed, at times I wondered if I’d have had as many problems getting a vintage trailer. I absolutely love those. A new window was installed, new cushion and new blind. I ended up camping only three times last year, but plan on more this year – already booked three trips and will squeeze in a few more. Now for the good things. I always thought I would buy the T@b trailer, but heard about this one while at a show. Looked at videos nearly every day waiting to see one in person. I am 5’9″ so this has more head room. My main requirement was it needs to have a toilet! Most places I camp have showers, but I also made a breakdown shower with pvc pipe and two shower curtains – and it works well. It’s nice to have all the modern conveniences and the sink is a really nice size. With each trip I am getting better at packing things and finding the best places for things. I did mention this is my first camper! Now I’m excited to glam her up a bit with cool curtains and other retro decorations. I agree some things could have been made better. I have bumped into the water pump switches and I noticed they are recessed in newer pics. I will try to put a guard around them. I want to move the blinds an inch closer to the window so I can add my fancy curtains, but will ask to see if wires run along there before I drill. And I will put some silicone around the bottom edges of the screens to help deter those little bugs from getting in. It’s only me using the trailer so I put a mattress cover and sheets on just one bed and use the other as a seat. I remove the table at night so I don’t kick it getting out of bed. I pull it with my 4 cylinder Subaru Outback and it tows pretty well. I really enjoy pulling off and enjoying a nice lunch along the way. And the cassette toilet can be emptied anywhere. Much easier than a black water hose I think. It is certainly a conversation piece as everyone wants to see it. Even the ladies with those cute vintage trailers. I will say I got a very quick and great response from Aliner when I wrote them about the problems I had. Now I just want smooth sailing. Looking at buying on next week. At this point would you still consider buying it if you could do it again? Also would love to see what you have done to it and how you go about storing things . Hello Carolyn. You mentioned you towed your Ascape with a 4 cylinder Outback. Was that on flat ground or up any hills? I also have an Outback and am curious to know how it would do pulling something like the Ascape up the mountains near me. Congratulations on your trailer! I hope you have had some good adventures! Thanks. I’ve seen them up here in Canada, Eastern Ontario region. The price in CDN dollars is $27500. That’s just a touch ridiculous. Is there storage under those seats? We appreciate all the good information here. 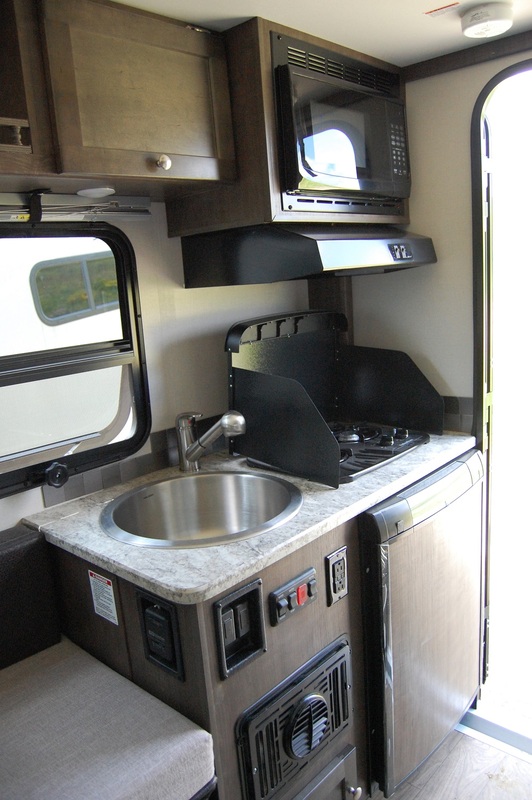 We are buying our first camper and want simple, light, and easy, but we do like a touch of “luxury.” The stove hood and a deep sink at thoughtful, high value adds for me. The cassette toilet design is very nice and keeps it simple/easy. Blackwater tanks and wet baths are not of interest for us. This will be used for 2-3 day biking trips so great to get confirmation we can stow our bikes in the camper! We’d love to hear about winter camping as we’d consider staying in campgrounds near ski resorts. Like others have commented, offering a more offroad/gravel road friendly version with bigger tires would close the deal for us. We’re not in a hurry to buy so we’re hoping next year’s line up addresses some of the bugs and unmet desires. The additional window at the front would be a great design addition. Been looking hard at the Ascape. Would love to see a clothes hanging rod over toilet that allows you to slide clothes forward when toilet is being used and back when not. Wonder if they have considered a no oven model, for more storage or fit a wall ac in its place to keep the trailer height down. Will be looking at next years offerings. Hi all! We are looking at an Ascape (first camper) for towing with our Subaru Forester. Given the relatively narrow footprint with the roof mounted A/C, I have some concern about cross winds, semi-trucks, etc. causing stability issues on the highway. I read one person (above) that mentioned semi trucks being okay, but wondered if anyone else has an opinions on wind/drag? Thanks! I have a couple of questions. You said all aluminum, does that include the frame? Also what axle does it have, is it an independent torsion suspension? Looked at one today, the frame is powder coated steel with a Torsion axle. Roof is aluminium , sidewalls fibreglass laminate . I like everything about this trailer except the air conditioner. Can it be ordered without as I plan on boondocking most of the time and therefore wouldn’t have power for it anyway. And to have that much more storage space would be great. I am looking for a cover for my 2017 Ascape ST. A company will custom make the cover if I can provide full measurement and pictures for the unit. I would rather get a cover from a company that has created one for my unit previously. Can you give me guidance for this.